Why Look At Mind-Body Balance? 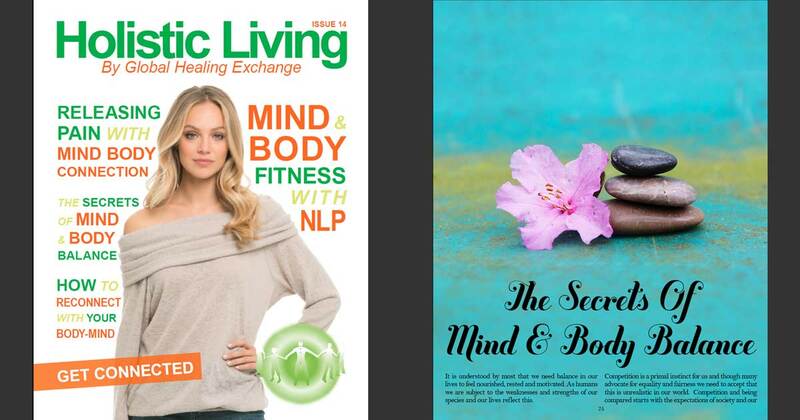 This edition of Holistic Living Magazine is talking about the Body – Mind Connection. This is an important topic because if you are looking at holistic health, you have to realise that you are far more than just a physical body. You need to understand how your thoughts affect your physical health. You need to look at yourself as a spiritual being, this includes looking at your energy. Modern medicine is now recognizing this as well as the teachings from ancient medicine. It still baffles me that some people think that everything can be solved by taking a drug but when the physical issue is caused by your thoughts, feelings and energy, how can a pill truly work? So what does the body – mind connection mean and how does it affect you? Your body responds to the way you think, feel, and act. The body – mind connection is your body’s underlying activity that occurs in the background of your consciousness or subconscious that affects your thoughts and feelings. In the same way the body affects the mind, the mind is capable of immense effects on the body. We need to start looking at the body – mind connection as a whole rather than two separate parts. Each one affects the other. When looking at true health and wellbeing the body – mind connection cannot be underestimated. There are ways that you can improve your emotional and physical health once you really understand this and see that it is about finding balance on all levels. Your body, mind and energy are all interconnected. Poor emotional health can weaken your body’s immune system, this makes it more likely that you will develop dis-ease within your body. Sadness, stress, and anxiety are all emotions. They can all lead to both physical and psychological health issues. When feeling one of these emotions, you may not take care of your health as well as you should. If these emotions are not dealt with they can cause, depression, autoimmune disease and muscle tension, amongst other symptoms. Treating the symptoms alone will never lead to long lasting holistic health. I hope you are beginning to see how the body-mind connection all fits together. In this magazine our experts will help you realise how to understand this connection and how to use it in a way to help you to heal physically, mentally, spiritually and emotionally. Finding this balance is key to enjoying a healthy abundant life. Once you find this balance it is amazing how life starts flowing through you in so many ways.